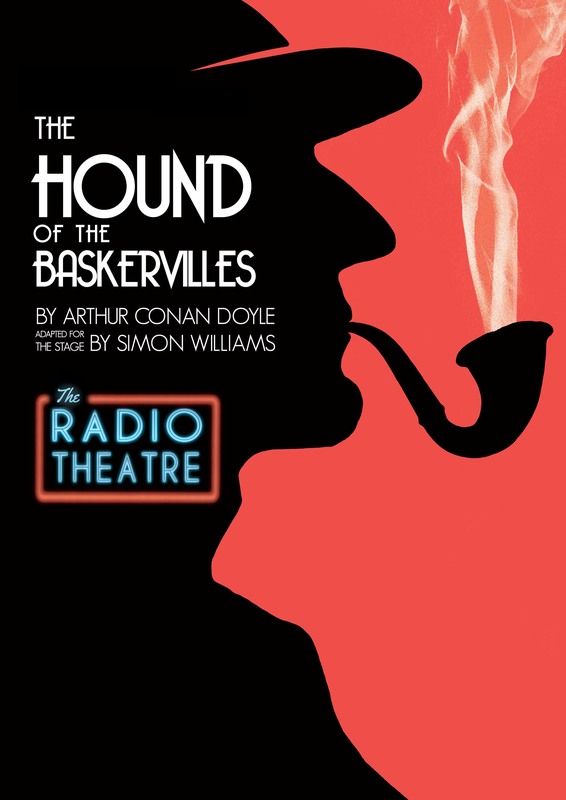 Veni Vedi Theatre’s ‘The Hound of the Baskervilles – The Radio Theatre’ is being sold as an immersive event theatre and whilst it ultimately struggles to live up to this billing , it proves itself as a very entertaining romp that successfully recreates the behind-the-scenes excitement of a live radio broadcast unfolding. The strength of Veni Vedi’s production initially appears to lie in the attention to detail placed on the period setting and the use of live sound effects to recreate the atmosphere of the Conon Doyle story. However this is a smokescreen that obscures the real talent that lies in successfully managing an ensemble cast through what is essentially one 2hr static scene. Director Natalie-Anne Downs has pulled off a minor-key miracle in overcoming the challenge of the format. One of the draws of the play is the use of on-stage sound effects but Downs’ manages to avoid it become the focal point of the production – which rightly remains as the Sherlock Holmes’ story. In every sense it enhances the evening and adds both a technical and emotional depth, as it is first admirable for its virtuosity before falling into the background and serving to drive the tension in the story. The play opens intelligently, running straight into the opening scene – perhaps a nod towards immersion – as the audience filters in. The adaptation of Simon William’s script provides inconsequential conversations as the radio actors arrive. This creates a free-flowing nature that adds a relaxed naturalism to the dialogue and allows the audience to feel as if they are genuinely overhearing conversations that hint of characters with lives that continue off-stage. So often in the theatre there is the sense that the audience is only being allowed to see what the playwright wishes us to see but with no scene breaks there is nowhere for William’s script to hide. This format lends a flow to the narrative that drives the pace along but one cannot avoid the fact that the play is effectively it is one long scene separated by an interval. Set in a studio during a live broadcast there is no mechanism for breaking the action and there are times when the attention can begin to flag. Downes’ introduces a number of devices to change the tempo and is well supported in this by the vibrancy of the supporting cast. The production is exemplary in its use of the ensemble and the characters are fleshed out enough to provide the audience with signifiers of characters; Phyllis the flustered and excited new girl, and the young sound-engineer who almost manages to steal the show as a caricatured rustic Butler perfectly in keeping with period radio theme. It is noticeable that Veni Vedi offers a number of ‘add-ons’, such as special performances encouraging the audience to wear era-appropriate clothing. The cuts to the Arts Council elicited the predictable howls of rage from those who do not like to think about the sustainability of public subsidy. However it is becoming increasingly evident that at such a cathartic moment, a number of smaller companies are taking ‘innovation to new levels and looking at how they can generate an audience without compromising the production. The production adds little to the original Conan Doyle story but then it doesn’t really need to. What it does offer is an enjoyable yarn that understands its USP and delivers to it. A balanced ensemble cast provide the energy needed to sustain the action and bounce off one another for well-judged comic effect. There is a clear hierarchy to the onstage characters that can only exist due to the lack of hierarchy off it.